Give power to the people with these custom promotional power banks. Connect with your employees and clientele through the gadgets they use daily. Power bank chargers make for practical prizes at trade shows, sure to boost your chances of landing potential clients. They also make generous giveaways for employees, volunteers, and brand ambassadors. 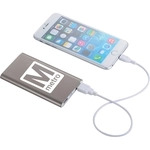 Give the gift of portable power for phones, tablets, laptops, and other on-the-go devices. Connect with your clientele by giving them a gift that keeps on giving. Recipients will love this trendy UL Certified Heather Custom Power Bank! This charger will provide power to all of your handheld devices on-the-go! Never run out of power by keeping this 2200 mAh Full Color UL Listed Custom Power Bank w/ Keychain nearby! It charges your cell phone using your phone's own charging cable. Charge almost any device with this 5000 mAh Type C Custom Power Bank, including smartphones, tablets, or even a MacBook! It smartly detects attached devices and delivers an ideal current. Never worry about your power running low with this UL Certified Custom Power Bank w/ Rubber Band Accent! This rechargeable lithium power bank works with most phones, making this a must have for any purse, backpack, or briefcase! Never miss an important call, text or email by keeping your device charged up with this portable power bank custom charger. Keep your tech devices at full charge whether you are near a power source in the office or at home, or on the road with this 2-in-1 power bank & wall custom charger combo. Never worry about losing your charge again with this UL Certified Vivid Custom Power Bank! It features a 3000 mAh charge that will easily power up your cell phone on-the-go. This Cobble Carabiner Custom Power Bank is UL Listed and provides 5000 mAh of charge! White LED's illuminate in the ring where the carabiner hooks on to the power bank. “Where’s the nearest charging station?”, “Is there a wall outlet around here?” These are common questions you'll hear at trade shows and expos. With a power bank, stopping to charge is no longer a necessity for your staff or clientele! 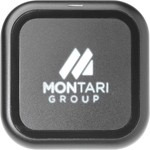 Give them a power source to keep on a keychain or in a pocket that's fully customized with your business logo. Recipients will no longer have to worry about where the next charging station is located. When selecting your custom power bank, consider the charging capacity. This is measured in milliampere Hour (mAH). The higher the mAH, the greater the capacity the charger has. Our power banks are small, slim and sleek, but don’t let size fool you. These power banks can fully charge iPhones and other tech devices! At ePromos, we offer a range of chargers from 2200 mAh to 8400 mAh, to fit both budget and occasion. A phone with a 1500 mAH battery can be fully charged once by a 1500 mAH power bank. Mid-to-higher mAH batteries can give 2-3.5 full charges to a phone and can charge an iPad about 40%. Once finished, simply recharge the power bank by connecting it to a power source. From built-in flashlights to Bluetooth speakers, ePromos has a broad selection of features to fit your brand. Choose your charger based on shape, size, price, and power. Then customize by color and add artwork to promote your logo! This is one of those promotional products that appeals to many demographics. There’s no limit to the applications for power banks in your company's marketing and promotional efforts. Get in touch with one of our brand specialists today to help get you started!